Thanks for stopping by the CU1 Blog! We’re pretty enamored with Alaskans at Credit Union 1, which is why you’ll find us sharing loads of fun and informative info on our blog, Facebook, Twitter, YouTube, Instagram and more. If you don’t already follow us on those venues, take a moment today and join the conversation! You can even send us questions and comments via social media, as another helpful way to keep in touch with CU1. For the third quarter in a row, Credit Union 1 is proud to have been named to The Financial Brand’s list of “Top 100 Credit Unions Using Social Media.” This list honors financial institutions that meet the following “Power 100” criteria, as determined by the industry renowned digital publication, The Financial Brand. 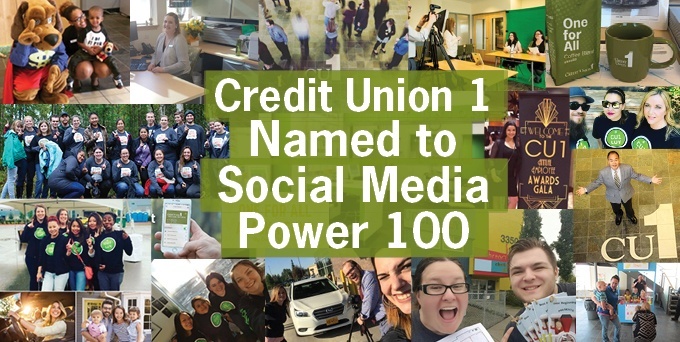 If you check us out on this Power 100 list, Credit Union 1 is currently the ONLY Alaskan financial institution to reach top social media ranking –and we’re also only a few hundred likes away from cresting 10,000 followers on Facebook. Tell your grandmother, best friend, cousins and mailman! When you follow us on social media, you’ll have unique opportunities to learn about CU1 (like though our tutorial series on YouTube), voice your thoughts and feelings (like through our April voting contest for best-decorated teller station), and enjoy an inside-look at our employees’ lives (seriously, we have some really cool people here). As a uniquely member-focused and community-minded organization, Credit Union 1 is happy to socialize with its Alaskan membership base via a variety of social media platforms. While we’re quite honored to be recognized on a national level for these efforts, we’d love it even more if our social presence helps you to feel more connected and in touch with your credit union. After all, we exist to serve and support YOU! Now take a minute to watch our latest YouTube video, because it’s pretty darn hilarious.